Is your dog chewing on items in your house when home alone? If so, your dog is telling you he is stressed during the day and has too much room to explore and too much responsibility. I recommend you put your dog in a kennel or a small area such as a bathroom or laundry room with a gate (dog-proof the area!). Give him a nylabone or other appropriate item to chew on. Teach your puppy or dog what is hers and what is not hers. “Not for Doggies” is what I label anything I take away from a dog. When you take the item away, always give an appropriate substitute, such as a nylabone. Repeatedly taking the “Not for Doggies” items away in a no-nonsense way teaches your dog what is not hers. She really doesn’t come automatically programmed to understand the difference between your fuzzy slipper and a fuzzy dog toy, so try to understand this and TEACH! Have lots of items around your house for your dog to chew on. Keep a few hidden up high, such as on top of the refrigerator. When your dog is bored with the bones or rope toys that are out, get a “new” one down and it will seem exciting. 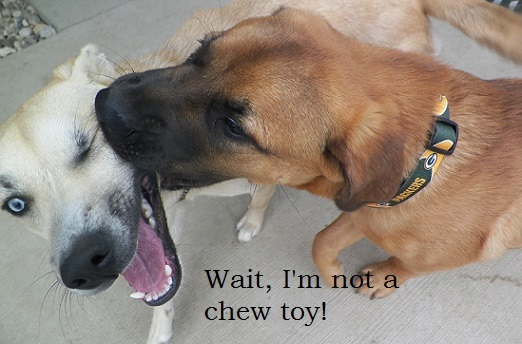 Don’t give up on one kind of chew toy if your dog doesn’t like it. I’ve seen dogs who could care less about a plain nylabone, but they go crazy for one shaped like a bear claw or a wishbone. Keep looking for one that will satisfy your dog. If your dog is chewing on furniture, keep a close eye on this and use the “Leave It” command every time you correct the behavior. If it is happening when you are not home, see tip 1 above. If you see it, stop it. Sometimes spraying bitter apple will help, but test it on the furniture first to make sure it doesn’t ruin it. Don’t allow your dog or puppy to chew on things he shouldn’t, especially his leash. While it may be cute to say he is walking himself, you are allowing him to put something in his mouth, and he could ruin it. Isn’t ruining things what we are trying to prevent when we want to stop chewing behavior? That includes his leash! 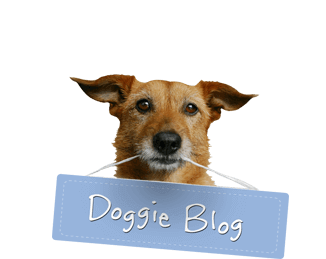 Do you have any great ideas that helped your dog get over a chewing habit? Please share!